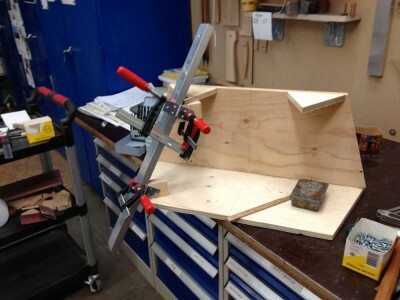 Today I completed one more ½ scale rudder mock up. It was elucidating. When playing with it I noticed that the connecting bar kept the rudders parallel to each other only when they were aligned close to the boats centerline. At bigger angles the lee rudder turned more. At Marström I have seen plenty of M20 and M32:s Rudders mowing in parallel thanks to the connecting bar. Why did mine not do so? 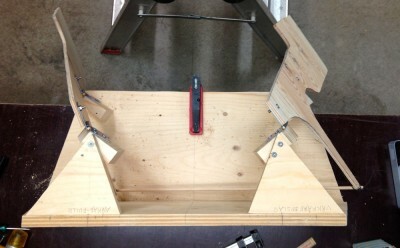 Simple, M20 and M32:s rudder axis are parallel. My rudder axes are not vertical. They are angled outward and back. When you do something new you always get it wrong the first time. You are a child in a new world. Why, because real life is to complicate to be imagined. Even the combination of a small number of elements gives many possibilities. Six persons can be placed in 720 different ways around a table. With six people one can have a different setting around a table each day for two years. With 24 persons the combinations increase to six times ten to the power of twenty-three. This is remarkable because even if you change settings a thousand times a second you have to continue a thousand times longer than our universe has existed. A boat contains many more elements than twenty-four. That guaranties that there are always new possibilities – and new ways of making mistakes. 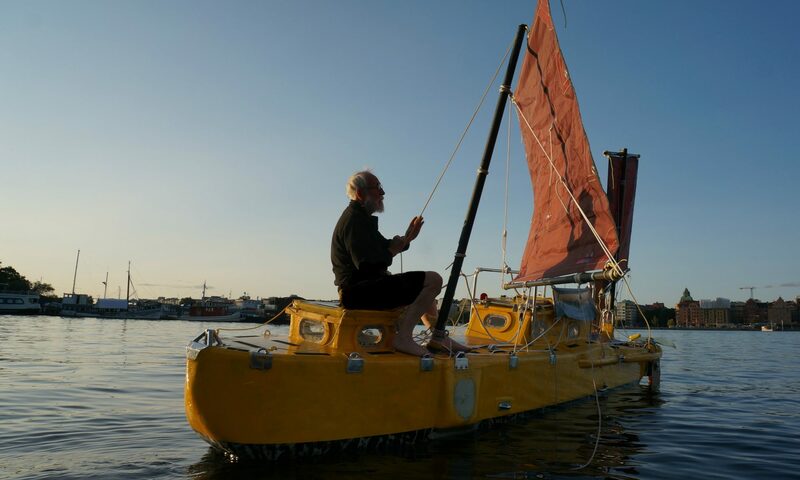 That is why I spend much time on making mock-ups and why building this boat takes longer than building one a conventional one with drawings from a yacht designer. But of course it is so much more fun and instructive. Going about one push the rudder to lee. 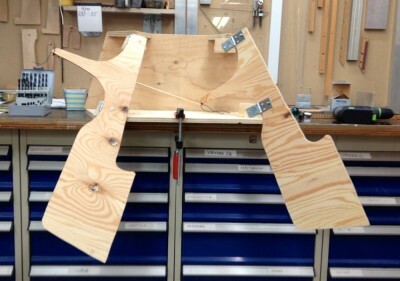 With this rudder arrangement the lee rudder will turn more than the windward on. Does it matter? If it had been wheels on a car and you were concerned with the Ackermann steering geometry and all that – Yeas. But rudders are not wheels. The rudder force is proportional to area and angle of attack. Both rudders give turning moment. If they are not equally big I do not mind. Why do I have a connecting bar? Answer – it gives a simpler line arrangement and both rudders turn at the same time. 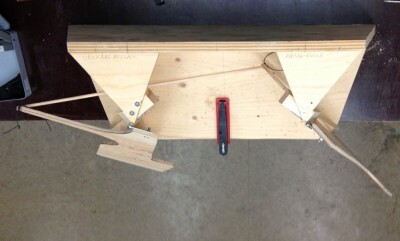 Aligning the hinges with the help of a ruler. The mock-up seen from behind. Seen from above standing on my ladder. Seen from abouve standing on the workbench.